There’s a sort of person who, upon hearing someone else speak passionately about a given subject, will respond with a certain stock phrase: “Why don’t you tell us how you really feel?” And when they do, they hit the “really” Chandler Bing-style to emphasize their point. They might smile. They might feel very satisfied for having said this. Here is some information about that person. That person is the worst. That person thinks it’s okay to use a cliched, straight-from-a-bad-sitcom phrase to tell you (or maybe sometimes me) not to speak your mind—or at least not to speak it in such a decisive manner. That person wants you to hedge your statements in softeners like “maybe” and “it’s possible” and may even want you to apologize before you offer your opinion, as if you didn’t get the proper permission before you talk. It may be that you have overstepped in talking. Sometimes you get heated and your words take a tone that is inappropriate for a given situation. You may need a reminder to check yourself. That’s entirely fair. But with respect to that, here is the worst quality of the person who speaks the phrase “Why don’t you tell us how you really feel?” or some variant: They don’t actually want you to realize you’re violating some conversational rule. They want to make you feel bad, to be embarrassed for having participated. They’re trying to make you stop talking. And they’re not attempting to go about this directly or even by inventing their own turn of phrase. Instead, they pick this garbage saying—a chunk of words that verges on “Smooth move, Ex-Lax” in terms of datedness and triteness, a phrase that approaches sarcasm but somehow even falls short of even that. It’s this cowardly form of indirect communication in which this person conveys a message but hides behind words that superficially would seem to mean the opposite. It’s a reprimand form of “Gosh, it’s really hot in here” when you actually mean “Would you mind opening the windows?” but you’re not willing to actually make that request. This is a person you should make an effort to avoid talking to them in the future. 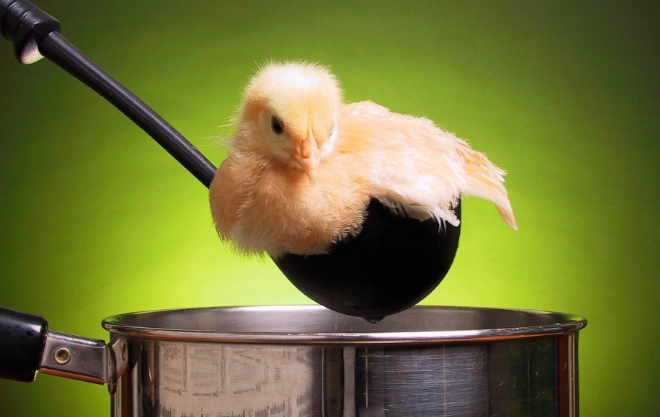 In closing, here is a picture of a baby duck sitting in a ladle. How is that not sarcasm tho? Even with the Chandler Bing-style delivery, I feel like it falls more into this class of overused phrases we have in English where we say the opposite of what we mean and every fluent speaker understands what you mean, like "Tell me about it!" when you actually mean "I understand what you're saying and understand you fully" or "You can't be serious" when you actually mean "I understand that you are serious and am expression surprise at the situation you are describing" or maybe even "I could care less" when you actually mean that you care very little as is. There's maybe a lack of biting irony to these that, at least in my mind, excludes them from the sarcasm party. That's sort of a concept of idiomatic sarcasm though. But in this case you're not being sarcastic because you don't really mean the opposite you mean "Oh my god no one cares" which is an entirely different, unrelated thought which we only culturally know what it means. It's just a normal idiom now. And while cliches do have their place it's a rare person that can use them with anything nearly adjacent to wit. I hate the whole 'make a request without making a request thing' it feels so passive-aggressive. Like a person on a road trip saying "Wow I'm thirsty" instead of simply asking to stop for a drink. I could understand that in some cases the request could come off too demanding but in most cases the requests are polite and simple things that most reasonable people would be reasonable about. Then again with the increased rarity of the reasonable person perhaps we're all just becoming passive-aggressive people too scared to speak our minds for fear of offending someone who's mother was scared by an open window or something.